AGENCY has been awarded the Architectural League of New York’s annual Emerging Voices Award. Other 2018 winners include: Fernanda Canales, Jesica Amescua and Mariana Ordóñez Grajales, Comunal: Taller de Arquitectura, Stephanie Davidson and Georg Rafailidis, Davidson Rafailidis, Luis Aldrete, Estudio de Arquitectura, David Seiter, Future Green Studio, Helen Leung and Elizabeth Timme, LA-Más, and Chris Baribeau, Josh Siebert, and Jason Wright, modus studio. Past winners include: Frida Escobedo, Murmur, The Living, Rael San Fratello, dlandstudio, MASS Design Group, SO-IL, SCAPE/Landscape Architecture, Lateral Office, Min | Day, and many more outstanding practices now shaping the profession. AGENCY will present a public lecture at the Architectural League in New York City on Thursday, March 8 – please join us! 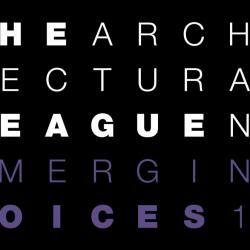 For other details and events related to the Emerging Voices series, please visit www.archleague.org.